Wang Thanon Phra Athit (Phra Athit Road Palace) is located on a site originally a residence of Chao Phraya Mahayotha (Thoria), the founder of Khachaseni family and the grandfather of Chao Chom Manda Klin, a wife of King Rama IV. The land had been inherited to H.R.H. Prince Krommaphra Naretworarit (Prince Kridaphinihan), a son of King Rama IV and Chao Chom Manda Klin. 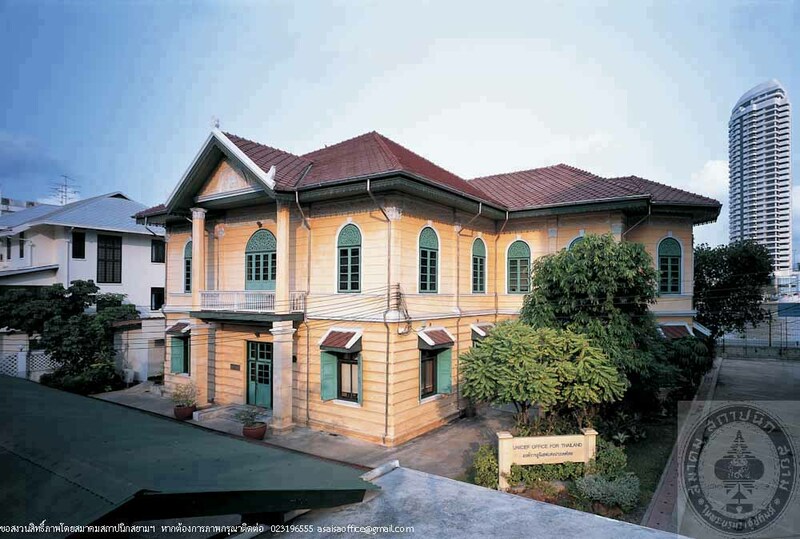 During the reign of King Rama V, the King had a 2-storey residence built for the Prince and his mother, known as “Tamnak Doem” (Old Residential Hall). In 1917, King Rama VI contributed his personal budget for building a new residence for H.R.H. Prince Krommaphra Naretworarit on the occasion of his 60th birthday. Hence the Prince moved to stay there his mother still lived at Tamnak Doem until she passed away. After that the Prince’s eldest son sold the estate to the Royal Property Office, or the Crown Property Bureau of today. King Rama VII had given Tamnak Doem to be a residence of H.R.H. Prince Sawatdisophon Krommaphra Sawatdiwatdanawisit, a founder of Sawatdiwat royal family. The Prince stayed at Tamnak Doem for a period of time before moving out and leaving it deserted. Then Khunying Linchi Suriyanuwat resided there during 1936-1938 and it became a residence and office of Mr. Pridi Phanomyong, the Regent, during 1942-1947, as well as another 3-storey building known as “Thamniap Tha Chang” (Tha Chang Office). In 1949, UNICEF leased Thamniap Tha Chang to serve as its office and the United Nations Development Programme (UNDP), in coolaboration with the Development Training and Communications Project (DTCP), and the Office of Maritime Commission co-rented Thamniap Tha Chang and also leased Tamnak Doem from the Crown Property Bureau during 1972 – 1981. UNICEF co-rented Tamnak Doem with these three organizations in 1978 before the Office of Maritime Commission moved out and UNDP/DTCP office was terminated in 1987. Therefore, UNICEF has become the sole tenant and moved its Area Office and Greeting Cards Operation to Tamnak Doem in late 1992. Tamnak doem is a 2-storey brick masonry building. Its hipped roofs were finished with cement tiles having twin gables on the river side and one gable on Phra Athit Road side. The roof decoration displays foliage designs stuccos on gable panels and wood openworkdecorating the eaves. The verandah on ground floor is enclosed with stucco balustrades while the upper floor balustrades are cast iron, giving the house a light and buoyant look. The façade on the side of Phra Athit Road features tall columns supporting the central gable of Classic Revival style. In the north there is a half-octagonal bay windowfeaturing stucco rusticated walls, stucco moldings, arch windows withwood openwork transom light fashionable in the reign of King Rama V.
At present, this historic building has been maintained with care by UNICEF who attempts to preserve valuable architecture and decorations of this palace.